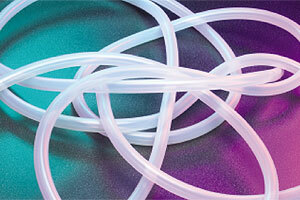 Sani-Tech® Sil-250 is a high-performance platinum-cured extended-life silicone-tubing formulation specifically designed for demanding peristaltic pump applications. With its superior flex life characteristics, manufacturing processes can be simplified by reducing potential production time due to pump tubing failure. Sani-Tech® Sil-250 has an extreme smooth inner surface that helps reduce the risk of particle entrapment during sensitive fluid transfer. SaniTech® is a registered trademark of Saint-Gobain Performance Plastics.